1. Run, hike and walk with your dog: Combine everything and try something new, invite your friend who also has a god and you all can go for running, hiking or walking. 2. Go to the park: A dog park is the perfect place for your dog to have a play time with other dogs at the park. You can find many dog parks in almost every city of United States. 3. Play “fetch”: Almost all dogs like to fetch things and it is a perfect exercise. Get a lightweight, soft toy form a pet store and play fetch with your dog, these toys are the best and safest, they won’t harm your dog’s teeth and mouth. Jumping may lead to injuries, so make sure there is no much jumping involved. 4. Play games with your dog: Games can provide your dog an opportunity to work out his body and brain as well. For instance, you can play hide and go seek with your pet inside your house or in any safe area, make your dog sit and stay, you go hide. Call him to come and find you when you are ready. 5. Spend a day at the lake: Dogs enjoy splashing in water and some dogs enjoy swimming. You should join your dog and have a great time together. There are some beaches that are especially meant for dogs, so you can take your dog there and spend a good time together. 6. Go skiing with your dog: You can go for cross-country skiing with your dog. The dog is buckled up to the skier. You can also take courses for skijoring and you can learn how you can enjoy this sport safely. For skijoring, dogs should weigh at least 15 kg. 7. 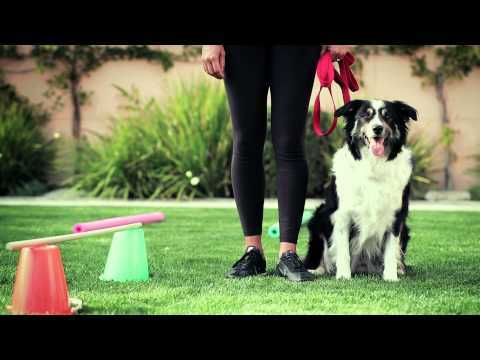 Dog sports: Agility or flyball are very popular dog sports. They boost the energy in dogs.